How to add/remove SearchEngines in TBird 58+? How do you edit that list? Specifically, how do you remove (e.g. Yahoo) and add (e.g. Google, DuckDuckGo) search engines? I'm guessing that for "default" you just select from whatever's in that list? Moving to Thunderbird Builds as 58.0b2 is a beta version. 1. Create a searchplugins folder in the profile folder, and copy into it the desired xml files such as ddg.xml, google.xml etc. 2. When you launch TB, the added search engines are not visible in Options, as expected. 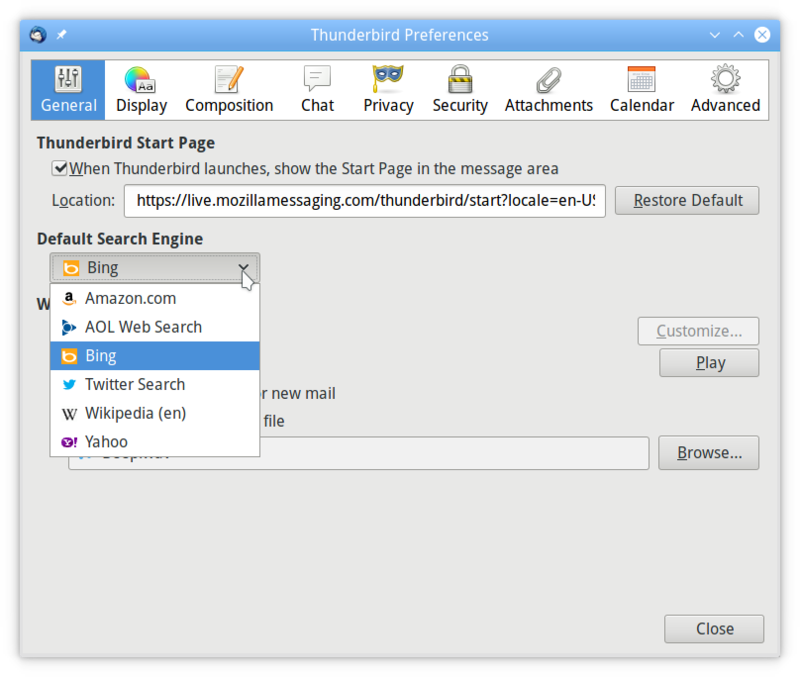 https://addons.mozilla.org/en-US/thunde ... thunderbi/ is an add-on for google search. That works fine with 52.5.2 but is ignored when I use the beta. viewtopic.php?p=14688149#p14688149 talks about how to add DuckDuckGo . I suspect it would have the same problem . The SearchWith add-on at https://addons.mozilla.org/en-US/thunde ... earchwith/ also works fine with 52.5.2 but doesn't work with the beta either. The list of search engines appears to be search.json.mozlz4 , which is a compressed file. I have devtools.chrome.enabled set true but couldn't execute the code at viewtopic.php?p=14708933#p14708933 in the error console to expand it. Really want to get that figured out. After the recent biz @ Firefox ("Oops, we've been 'accidentally' collecting telemetry even if you turned it off") I personally don't want ANY pointers / links / etc hardwired in, even if they're off. For me, Yahoo's gotta go. Microsoft / Bing too, ideally. Tried that. Didn't work in 58.0b. tanstaafl wrote: add-on for google search. That works fine with 52.5.2 but is ignored when I use the beta. I coudln't even get it to install. tanstaafl wrote: The list of search engines appears to be search.json.mozlz4 , which is a compressed file. I have devtools.chrome.enabled set true but couldn't execute the code at viewtopic.php?p=14708933#p14708933 in the error console to expand it. Over my head. Or at least more than I think you should have to do for user config. Any idea why @ Mozilla thinks its a good idea to hardwire these in, without editing? Is Mozilla still getting paid off by Yahoo & Bing to hobble TB? Sorry to hear that. It works here in W10/TB 58b2, with both DDG and Google. Maybe your xml files are incorrect? "Create our own, or Clone Firefox's , user interface to allow users to modify open search providers"
So it's a known issue and is hopefully gonna get fixed soon, in 59 maybe. It's not clear 2 me if that 'll also allow you to DELETE/REMOVE them.